Mr. Horner's class is full of young engineers. Read more here. 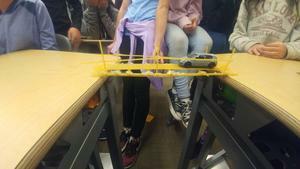 Mr. Horner's 6th grade class has been busy with the engineering process. They have had to build towers and move cups without touching them. They finished up the unit with a bridge process. Using the engineering process, they had to design a bridge that could support a toy car between two desks. The only materials they had were spaghetti noodles hot glue. The engineers had a lot of fun with this hands-on project!